Three popular staples from Presto, Cuisinart and Aroma Housewares maintain their dominance in the electric skillet category, alongside new Dash and Bella models that showcase PFOA-free nonstick coatings. Whether you're cooking for a big family, looking to cook without heating up the house, or want cook-and-serve convenience, we recommend an electric skillet for any size household. 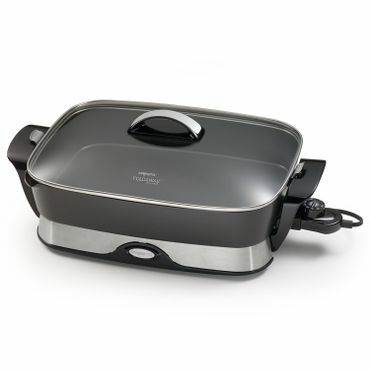 Reviewers can't say enough good things about the Presto 06857 Electric Foldaway Skillet. It heats quickly and easily, cooks just as well as a stovetop frying pan, and is big enough to serve a large family. The Presto 06857 even serves as a backup oven -- users say it can bake a cake, cook a roast or make a casserole. This electric skillet is dishwasher safe and all the parts nest together to make for a small storage footprint. The 14-inch, 1800-watt Cuisinart CSK-250 Green Gourmet Electric Skillet sports a durable ceramic-based, PTFE-free, PTFOA-free non-stick interior coating that releases food easily. Users say this powerful electric skillet does a great job of frying, griddling, simmering and braising. Its heating element adjusts between "warm" and 450 degrees, the tempered glass lid lets you see how your food is cooking, and the whole cooking pan is dishwasher safe once you remove the heating element. Users like that the 12-inch Aroma Housewares AFP-1600S Gourmet Series has no interior coating at all -- just a solid body of 18/10 stainless steel that cleans up easily with a quick soak and scrub. The AFP-1600S is a good value, heating quickly and cooking evenly, with a glass lid that lets you monitor progress. Owners say it also provides more cooking space than you might expect: It's even big enough to cook a good-size pot roast. Electric skillets are highly versatile appliances: They're great for adding a food prep option when you're preparing a big meal, as a standalone appliance when you don't feel like heating up the kitchen with your oven or stovetop range, or even as an all-in-one dish for preparing and transporting food, then keeping it warm on the buffet table. Like traditional skillets, electric frying pans can be used for sautéing and pan frying. The best electric frying pans can brown your meat nicely before cooking it, but if you're looking for true searing action, you might be happier with an electric grill. In that report, we also discuss electric griddles -- probably the best choice if you need bulk capacity to cook foods like pancakes, French toast or bacon for large groups. Some electric skillets also work for deep frying, although if you do a lot of frying, you should consider purchasing a dedicated deep fryer. The majority of electric frying pans are made of aluminum, with a nonstick coating on the interior and a glass lid that makes it easy to monitor how your food is cooking. They also tend to be fairly large and deep, allowing plenty of room for the cook to prepare multiple foods at once or cook enough servings for a family. The largest electric skillets we review in this report are rectangular and run 16 inches down the long side -- plenty large enough to use as a chafing dish on a buffet tablet. However, if you're cooking in a confined space (like an RV) or for just one or two people, we also found good electric skillets that are as small as 8 inches square. Without a doubt, the rectangular 1500-watt Presto 06857 Electric Foldaway Skillet (Est. $50) is a top pick in this category. Versatile and reliable, the Presto 06857 heats evenly (between 0 and 400 degrees) and holds the set temperature automatically, instead of cycling on and off as many electric frying pans do. Owners say that this 16-inch skillet roasts, braises, grills and fries as well as a traditional skillet, and a built-in pour spout makes it easy to drain grease off. You can even bake in the Presto 06857, and its generous capacity makes it ideal for preparing large casseroles, side dishes and pasta dishes. Although it's large, this foldaway electric frying pan is also very portable. The built-in spoon/spatula holder, stay-cool handles and "keep warm" setting make it extremely convenient for serving food buffet-style. The nonstick coating on this Presto electric skillet cleans up nicely with just a wipe-down, both inside and out. 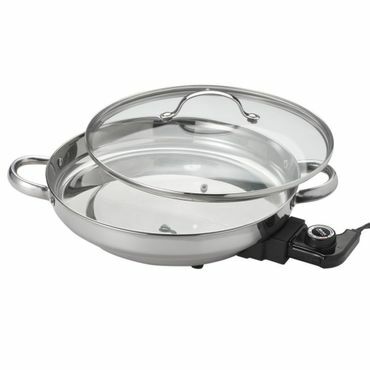 Both the skillet pan (which separates from the base) and the lid are submersible and dishwasher safe, as long as you remove the heat control first. The Foldaway Skillet's most popular feature, though, is in its name: Owners love having the ability to pack all the pieces (skillet, heating element, base and lid) together and store them away in a fairly small space. The rectangular shape helps reduce its footprint even more. Just make sure you place something soft between the base and the frying pan interior to protect the nonstick coating. Those who bought this folding skillet to use in an RV or smaller vacation home are particularly pleased with the foldaway feature, as long as their RV or vacation kitchen has enough room to accommodate the skillet's rather large footprint when it's all put together. If you don't need a 16-inch skillet, the 11-inch Presto 06626 (Est. $40) may be a better choice. It doesn't fold into a smaller size, but it does have the same heat control that maintains a steady target heat instead of cycling on and off as most electric skillets do. It also has a useful keep-warm setting and, like the larger foldaway skillet, the Presto 06626 is fully immersible and dishwasher safe once you remove the heat control. If you're looking for an even more petite frying pan for occasional small-scale use, we like the 800-watt Nesco ES-08 Electric Skillet (Est. $40) Even though the Nesco ES-08 measures just 8 inches to a side, users say it heats up evenly and is big enough to cook for one or two people at a time. The walls of this little skillet pan are deep enough for cooking soup, but not so deep that you can't use a spatula. You can even roast or fry in the Nesco ES-08 -- as long as whatever you're cooking isn't very big. Both the skillet pan and the lid wipe off easily, and the lid can go into the dishwasher. 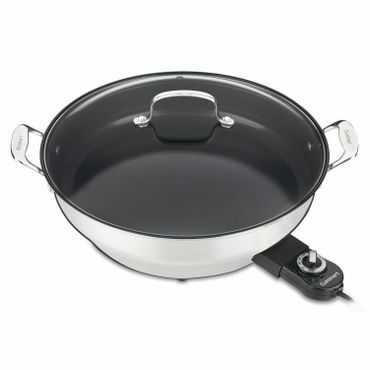 The nonstick coating generally holds up well, and users are usually so happy with this skillet's bargain price and petite size that they don't mind that the heating element has numbers (1 through 5) instead of degree settings, and that it cycles on and off once it reaches the set heat, as is typical for most electric frying pans. However, if having a precise cooking temperature is your highest priority, you'd do well to invest in a Presto Foldaway Skillet or its 11-inch cousin. Last year, we took note of the Zojirushi EP-RAC50 (Est. $190) electric skillet. This skillet continues to trend with users who want a large, high-end appliance that can feed a whole family, plus guests. It's earned its nickname as "the Cadillac of electric skillets", and the combination of deep-dish removable pan, steamer insert, and flat titanium- and ceramic-enhanced nonstick grilling plate mean you can use it as several appliances in one. Users love the Zojirushi EP-RAC50's multi-functionality, and say that the removable pans make cleanup a dream. The skillet heats up quickly and easily, and the sliding temperature control -- which ranges from "warm" to 480 degrees -- is very accurate. Other convenient features include a tempered glass lid that lets you gauge your food's progress, stay-cool side handles, and a pull-away cord that reduces the risk of the skillet's contents spilling if someone yanks on the cord. Users also say that the nonstick finish works wonderfully, and that the Zojirushi EP-RAC50 looks good sitting on their countertop. That's a good thing, because at almost 18 inches across, some may struggle to find adequate storage space for this round skillet. The nonstick finish works wonderfully but, like any non-stick appliance, the finish on the Zojirushi EP-RAC50 should be handled with care. Just like their non-electric brethren, there's a constant tradeoff between electric frying pans made of stainless steel and those made of aluminum. Electric skillets made of aluminum heat up faster than steel, conduct heat better, and are less expensive. However, stainless steel lasts longer and is less reactive, so it won't impart a metallic aftertaste to extremely acid or alkaline foods. Stainless steel is also a good choice if you have concerns about conventional nonstick coatings -- which most aluminum pans sport. The 1800-watt stainless steel Cuisinart CSK-250 Green Gourmet Electric Skillet (Est. $140) goes one step further, adding a petroleum-free, ceramic-based interior coating that means you need very little oil or butter to make food release easily. Users say this electric frying pan heats evenly ("warm" to 450 degrees), the interior coating is durable and releases food easily as long as you remember to add a little oil, and the round, 14-inch-diameter cooking area means you have enough space to cook for an entire family. The Cuisinart CSK-250 does a great job of frying, griddling, simmering and braising, and it looks great sitting on a buffet table too. However, it does have one big flaw: The vent hole in the tempered glass lid is too small, so steam tends to either sputter out of the lid, or condense and pool under it. Otherwise it's an excellent electric frying pan, however, and users love that once you remove the heating element, this electric skillet is dishwasher safe. Completely uncoated stainless steel is another excellent choice for people who are concerned about an aluminum skillet's non-stick coating flaking into their food -- and it's less expensive than ceramic. Just use a little oil, butter or cooking spray with the stainless steel skillet and your food will slide right out. If that's the type of skillet you prefer, we recommend the round, 12-inch Aroma Housewares AFP-1600S Gourmet Series (Est. $70). It has no interior coating and uses an impact-bonded base to help its 18/10 stainless steel conduct heat better. It heats quickly and evenly, is large enough to cook a good-size pot roast, and represents a great value. On the downside, the Aroma Housewares AFP-1600S is not submersible or dishwasher safe, and user reports show that the temperature control (which adjusts between 225 and 425 degrees) is the weak point that tends to fail first. Also, we found a few posts indicating that, while the side handles stay cool, the long metal handle and the lid both get hot. Watch out for the one-year warranty's expiration date because once that's over, users say customer service won't do anything to help you. Although conventional nonstick coatings are very popular for their ease of cleanup and use, they may also contain trace amounts of perfluorooctanoic acid or PFOA, which is used in the manufacturing of most nonstick coatings. Since the publication of studies that have suggested a link between PFOA exposure and increased risk of some tumors, cookware with non-PFOA nonstick coatings has gained a real foothold. Non-PFOA nonstick coatings also tend to be more durable than a conventional nonstick, which will flake off (and maybe end up in your food) if you don't treat it very delicately. Of the non-PFOA nonstick skillets we've considered, the ceramic-coated Cuisinart CSK-250 Green Gourmet Electric Skillet -- which we discuss above -- is the best choice. Its interior coating is durable, releases food easily as long as you add a little oil or butter, and cleans up easily. With that said, we've turned up two more nonstick, non-PFOA options that show a lot of promise. Like the Cuisinart CSK-250, the 1300-watt, 14-inch Dash Family Size Skillet (Est. $60) uses a ceramic surface for its nonstick coating. This is more appropriately called stick-resistant -- a little oil or butter helps the food release cleanly -- but users say it cleans up easily with a soapy sponge. There are a couple of quirks to watch out for with this round skillet. It's not the best at simmering, users say, although making sure you get the thermostat inserted properly helps it do a better job of temperature control. And because its stabilizing feet are only located under the handles, it can be a little tippy if you press on the other sides. But users also like its simple, straightforward operation and say it heats up faster than many other electric skillets -- a plus if you don't mind the short learning curve to master its heat settings. So if your priorities are finding a PFOA-free skillet that can easily cook up tacos and other skillet meals for the entire family, the Dash Family Size Skillet is a great choice. The 1200-watt, 12-inch-square Bella 14607 (Est. $40) takes a different approach, using a copper-titanium coating for its nonstick surface. This skillet does heat quickly and runs a little hot, so like the Dash skillet, it's not a great choice for simmering. But if you don't mind that quirk users say the Bella 14607 is a great skillet. Users aren't always sure what kind of nonstick they're dealing with, but they like how the copper-titanium coating doesn't flake or peel, and it cleans off easily with a quick wipe or a sprinkle of baking soda if the copper has started to blacken. There are few up-to-date expert reviews of electric skillets, but user reviews at sites like Amazon, Walmart, Best Buy and Williams Sonoma more than take up the slack by helping us gauge each skillet's performance and convenience under the widely varied circumstances of everyday, real-world use.